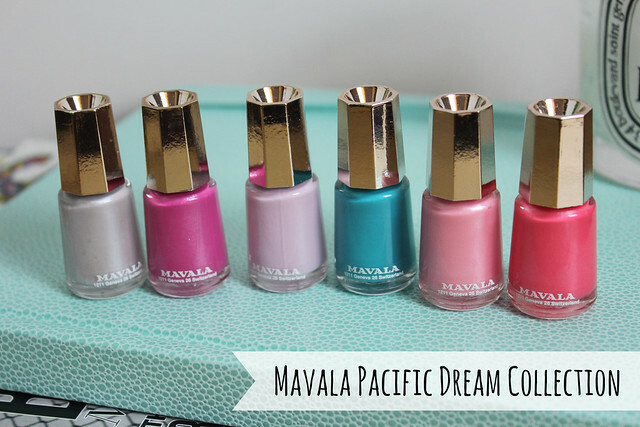 In another post where I lament the end of Summer, we have this lovely little day-brightening collection from Mavala. This is the Pacific Dream collection and yes, the colours are probably more Summer than Autumn but pah, who cares about colour rules. And regardless – the silvery grey is a universal shade that works whenever. This collection does however make me wish I was sitting writing this from a Malibu beach house overlooking the Pacific surf watching some hot Hollywood actor/model/rock star run around being all athletic and manly yet sensitive playing with a fluffy labrador? Has my imagination run away with me now…probably – back to nails! ‘Cool Silver’ – Yes it’s silver, but to be it’s very much on the grey side of the family and that makes it my number one favourite from the collection. The one shade you can wear with anything and looks good with anything. ‘Pretty Fuchsia’ – A bright creamy fuchsia, the name pretty much says it all! I like the combination of this and the ‘Pacific Blue’ turquoise shade… reminds me of Cameron Diaz’s dress/jewellery combo she wore to the Oscars a few years ago. A gorgeous magenta with turquoise accessories. ‘Slick Opal’ – Not sure if I get why its called opal, I always thought opal was a pearlescent type of shade and this to me is a pale creamy lavender/lilac shade, with no pearlyness to it. But it is a pretty shade – lilac is one of those colours that I love year-round regardless of season or weather. ‘Pacific Blue’ – As mentioned above, I love the combination of this and the Fuchsia shade. Very different yet love what they look like together. ‘Smart Pink’ – The shade the Elle Woods would wear. A proper girly pink with a pearly finish to it – Barbie would love this. Has the slightest peachy tone to it too, very pretty. ‘Funny Coral’ – Slightly more pink than coral to me, but it does have that mixed look to it. I actually like this one a lot – it’s bright but still creamy and wearable. It’s toned down enough that the coral doesn’t need to be too Summery – a good transitional shade for end of Summer. All of the colours are really great to apply, with Pacific Blue being the only one that I think would benefit from a third coat – the others are all good at two. My top pick is definitely Cool Silver – a great all-rounder shade and something quite unique. 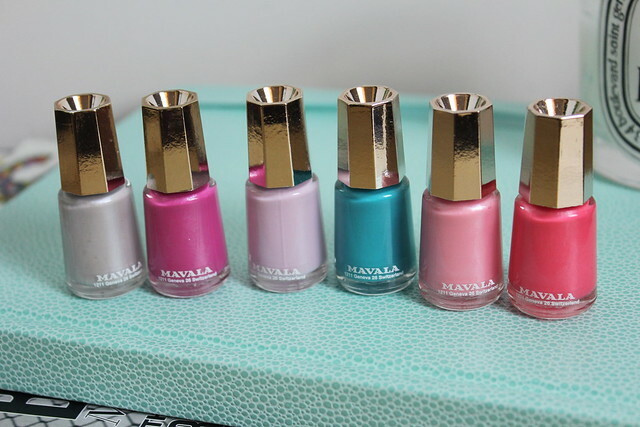 As always when I blog about Mavala – I have to mention how much I adore the small bottles, I’m sure they were one of the first brands to have such dinky bottles and to me it makes perfect sense. Who even finishes a full bottle now a days anyway!? The funny coral one is my favourite, it looks so gorgeous! Mavala are such an underrated brand but their polishes are fab! They do a lovely purple ombré set and some of their glitters are phenomenal! Oh wow, all these colours are so lovely!